Major celebrity spotting! 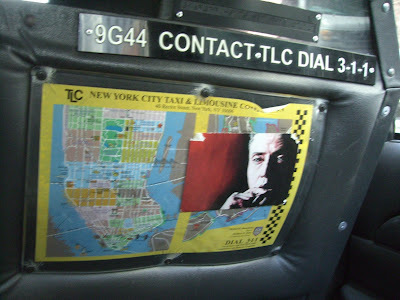 Christopher Walken in a taxi! My van broke down, so I had to take a cab and who do I see smoking a cigar in the cab? Christopher freakin' Walken. Yeah baby! More cowbell. I've noticed that most of my pictures fail to include people in them, so here's something different... a lady walking her dog on Rivington Street in the Lower East Side. 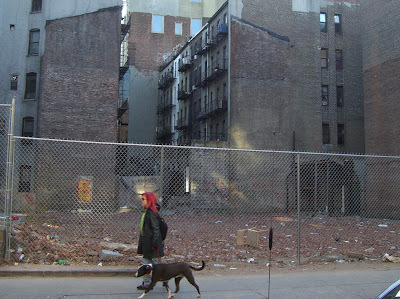 The vacant lot behind her was formerly home to the First Roumanian American Congregation- a Jewish synagogue built in 1857 (here's what it used to look like). Tragically the roof collapsed last year and the owners decided to tear down the whole building rather than rebuild (full story). The lot is on the market for $14 million now. And the lady walks on. Ever since I got my sweet new van, I've been forced to take notice of vehicular service amenity establishments. Apparently there's a ton of people who use cars! Who knew? But sometimes you just have to wonder...is this a place I can trust to service my automobile and can I go into this store and ask for a lube job without totally cracking up laughing? This is an actual place on Long Island.. yes that says "Nut Just Lube". 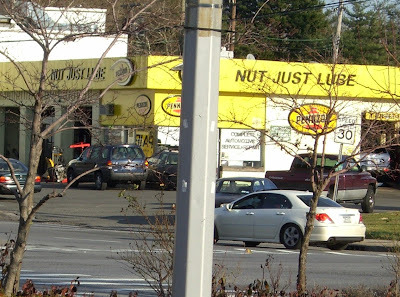 Perhaps the signmaker messed up and they got a discount and just decided to stick with it, or maybe they had to change the name for legal reasons or maybe they really did intend to name their store Nut Just Lube. Whatever the case it's totally awesome. As the proud owner of a graf'ed up sweet van myself, I tend to notice my fellow van owners (or "van-gelicals" as we like to be called) who go above and beyond the standard MAACO $159 paint deal. 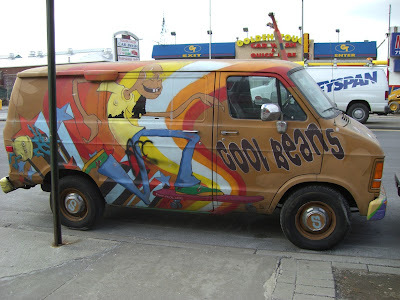 Today I saw the cool beans van parked and it is without a doubt cool beans yo. It meets all the basic pimped graffiti van requirements: Rainbow bumper- check. "S" hubs- check. Skateboard dude with two teeth and star eyes being chased by a purple dog/aardvark hybrid in a pinned on diaper- check. 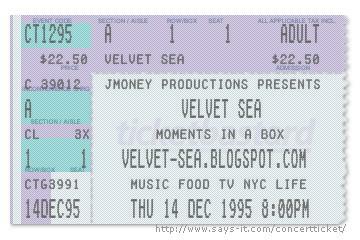 Cool Beans Van, you have officially received the Velvet Sea seal of approval (not to be confused with the sea lion of approval). Normally I'm a huge fan of Time Warner Cable, with their advanced services such as DVR's, digital cable, RoadRunner internet service (beep beep), video on demand, extensive channel lineups, rarely interrupted service, ability to pay automatically via credit card, etc. But why does it require someone to come to my apartment when I move to turn on my cable? After waiting over a week for an appointment, the serviceman basically looked at the back of my box and called in the serial code. I could have done that 8 days ago myself. Time Warner's Manhattan office on 23rd street is pretty awesome; free internet while you wait, computerized waiting list with lots of seats, many many customer service representatives who sit behind a low counter with a friendly smile. The Brooklyn office is pretty much the complete opposite- completely disorganized, with unclear signage directing you where to go. To exchange equipment, you find a small 1 foot square sign, telling you to wait in a dark alcove with 4 seats. Adjacent to the alcove is an office with 2 customer service representatives sitting behind a huge wall of bulletproof glass. There is no little cutout near their mouths , it is a solid wall of glass and it makes conversing with the CSR extremely difficult and repetitive. To physically trade in equipment, there is a huge box build into the glass with doors on both the tellers' side and customer's. It's a completely ridiculous and unfriendly system. 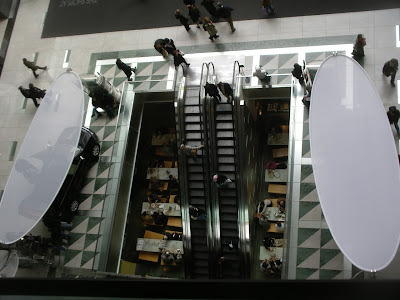 So now I've got my service back, I present to you this photographic moment of Time Warner zen from high above inside the Time Warner Center mall building. I wonder if residents of this building have to wait a week for an appointment too. Doubt it. You know the day divides the night, night divides the day but the doors divide the outside and the inside. Oh don't ask why. You know that I would be a liar, if I was to say to you that I'm a back door man. Strange days have found us today but maybe it's not the day but the people- people are strange but can't you see that I am not afraid. I envision an LA woman walking out these doors, as she did one thousand times before; an actor out alone, like a dog without a bone. Won't you tell me your name? 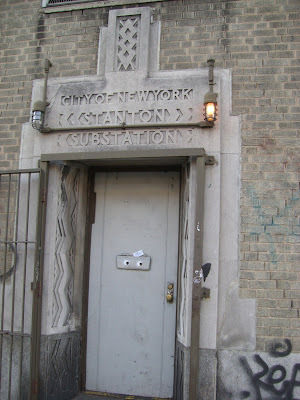 Oh, Stanton Substation it is. Well, turn out the lights and save our city, save our city. It's all over. This is the end. I'm goin' away. There's always been something about this block on 1st Avenue between 87th and 88th Streets that I find very visually appealing. The buildings are all the same yet each has it's own unique personality. The consistent heights and nearly complete row of cornices add to it's allure as one of Yorkville's finest avenue blocks. 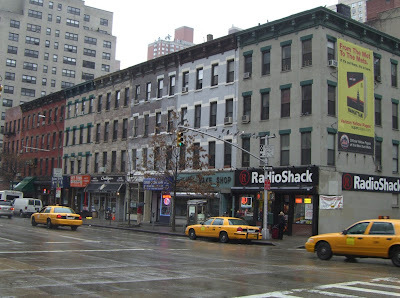 The building next to Radio Shack is the prettiest of the bunch and is home to Glaser's Bake Shop, the hands down no doubt about it best bake shop in all of New York City. They've been baking in this exact location since 1902 (!!!!!) and would not have lasted this long if their products weren't the tastiest. You can smell the bakery goodness wafting in the air from some distance away. The store has an old NY feel to to it with tiled floors and built in wood shelving displaying how the store looked 100 years ago. It is still run by the Glaser family. I highly recommend the black and white cookies. A seagull in winter. You might recognize those steps and columns in the background from every single episode of Law & Order, usually at the end when Jack McCoy descends smugly, sometimes in his ridiculous winter fedora hat. Dun dun. 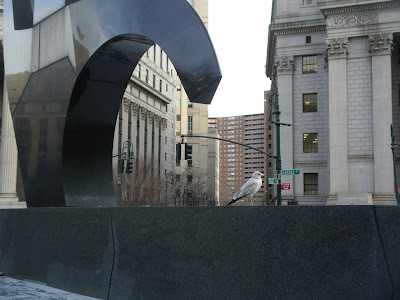 Note the New York attitude of the seagull with his head cocked in the "you lookin at me?" position. The seagull would like to remind you that in the criminal justice system, the people are represented by two separate yet equally important groups. The police who investigate crime and the district attorneys who prosecute the offenders. Dun Dun. 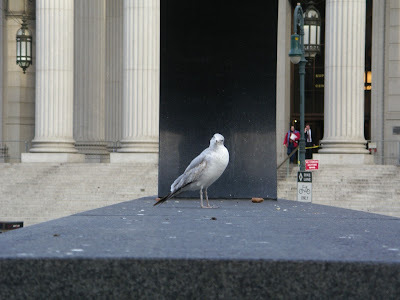 The seagull would also like to say the Vincent D'Onofrio is horrible on Law & Order: Criminal Intent and that is attributable to both his acting and the writing. Briscoe rules now and forever. Dun dun. 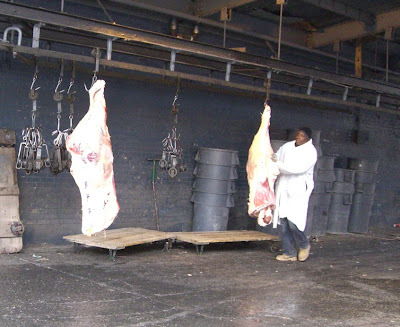 Usually the only meat in the Meatpacking District is stuffed into some New Jersey guido's too tight designer jeans. 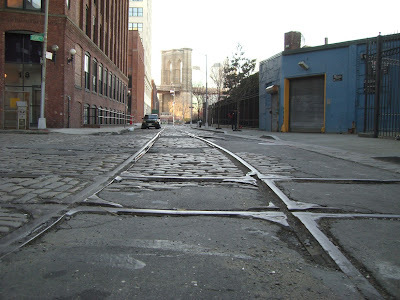 The area was formerly dominated by the meatpacking industry but is now home to trendy galleries, trendy restaurants, trendy nightclubs, and trendy high end fashion. 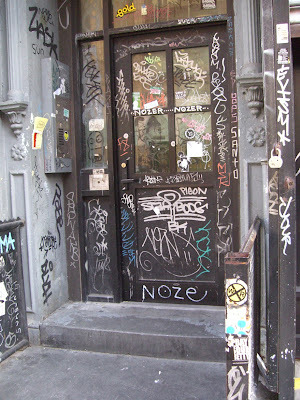 Imagine the smell of the dripping blood, sawdust, and internal organs combined with the washed out scent of perfume and puke from some fake boobed hoochie who tripped in her high heels over the cobblestone streets last night after leaving a nearby club and puked out all seven $15 vodka RedBulls right on the very same sidewalk your juicy sirloin is now traveling above. Meat in motion! The meatpacker above slides it along the track from the truck to the building. From there it goes pretty much directly to your plate. The Meatpacking District is still alive. Yum! 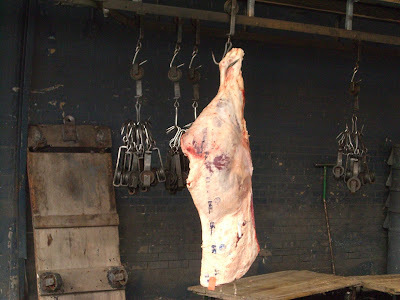 Meat! 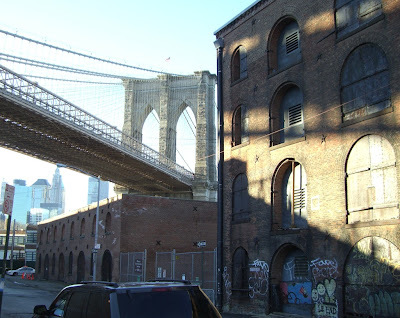 Dumbo is the neighborhood in Brooklyn between the Manhattan and Brooklyn Bridges. Although technically it's D.U.M.B.O. standing for Down Under the Manhattan Bridge Overpass. Now you know, and knowing is half the battle. 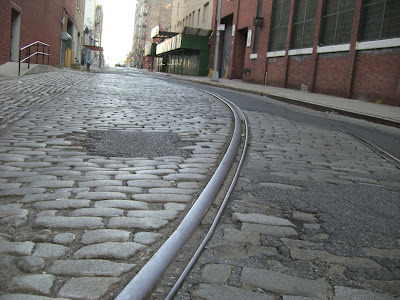 Most of Dumbo is covered in cobblestone streets with occasional train tracks protruding. Many of the old warehouses have been converted to lofts, originally for artists but now for rich people. Around every corner is another view of one of the bridges. There's not much going on in Dumbo as far as stores and restaurants go but it does have views galore and I enjoy walking around on it's desolate streets.